Bernie Sanders’ campaign team has slammed reports of voting irregularities at the New York state primary as “absurd” after more than 125,000 Democrats were unable to cast their ballots due to a mixture of broken voting machines, missing ballots and purged voter rolls. The figure of 125,000 accounted for voters registered in Brooklyn, the district where Sanders was born. Thank you to all those who came out tonight in New York! Onward to five more states voting next week. Speaking to his supporters during a rally at Penn State University, the left-wing senator said it was “absurd” that voters in New York were having difficulty in being able to vote, or had wrongly been removed from the voting register. "It has been reported to us from voters and voting rights monitors that the voting lists in Brooklyn contain numerous errors, including the purging of entire buildings and blocks of voters from the voting lists," De Blasio said in a statement. "The perception that numerous voters may have been disenfranchised undermines the integrity of the entire electoral process and must be fixed," he added. "The people of New York City have lost confidence that the Board of Elections can effectively administer elections and we intend to find out why the BOE is so consistently disorganized, chaotic and inefficient," Stringer said. The problems started early and were widespread, with several polling stations in New York City and elsewhere opening late. In Hempstead, the polls opened half an hour late because the poll's chairman, the only person able to unlock the machines, hadn't arrived. "I felt disenfranchised and dumbfounded," William Charpied told the New York Daily News. "It is difficult to understand how volunteers could be present while the single most important individual, the chairperson, was missing." In some places, including the Bishop Ford School in Windsor Terrace, the voter registration books for the latter half of the alphabet never showed up, Gothamist reported. There were no records there of voter names and signatures corresponding to last names N-Z. "I told them my name and they just sort of looked up at me and said, 'We're sorry, we only have one of the books'," Leo Roth told Gothamist. Broken ballot machines held up voting in at least one precinct. As of 11 a.m. local time, all the scanners at PS 216 in Gravesend were down, and it was unclear when two more would be delivered, according to Gothamist. 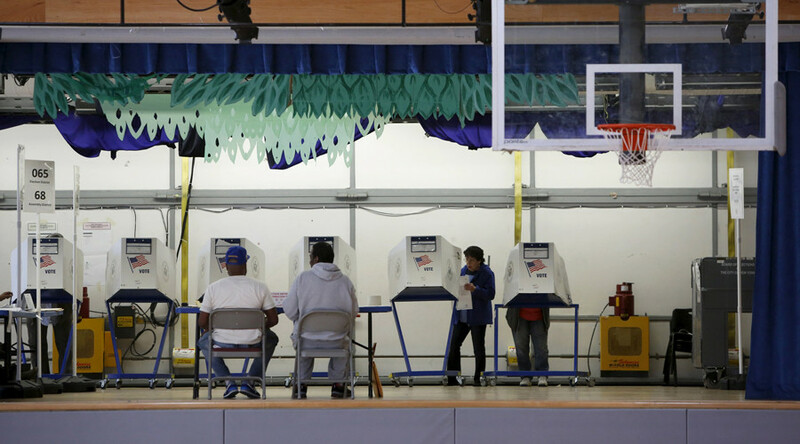 "Both our scanners are down ‒ it's horrible, we should have had four," a Board of Elections worker told voters, who were instructed to leave their filled-out ballots for agency employees to scan once the new machines arrived. There was confusion on the ballots, too, at least in the 12th congressional district. While Democratic voters were told to select seven delegates, there were only six possible choices who supported candidate Bernie Sanders. His rival, Hillary Clinton, had seven potential delegates. When Gothamists’s John Del Signore asked a poll worker what to do, she told him: "Oh, it doesn't matter. Some people don't even fill that part out." He later found out from Democratic National Committee spokesperson Deshundra Jefferson that there is a process for what happens if Sanders wins the district, albeit a convoluted one. "This means that the [Sanders] campaign only had 6 [delegates] to file while the Clinton campaign had 7. The total allocation will be proportionally allocated to the two candidates based on the results in that congressional district,” Jefferson said. “Finally, if a candidate had not slated enough delegate candidates, there is a process in the Delegate Selection Plan to allow for that candidate to elect the additional delegates." At the Lower East Side’s PS 20, Katelyn Glass, a registered Republican, was handed a Democratic ballot because they didn’t have any for GOP voters, she told Gothamist. "I then came back and... told them I was a registered Republican, and they instructed me that they had no ballots for my table but I could either come back or just vote affidavit," Glass said. "The women in charge literally said, 'You're going to love this. They never delivered the Republican ballots. I'm a Democrat, but even I think this is a complete injustice’." There was some movement on a lawsuit filed Monday by Election Justice USA on behalf of Democratic voters who claimed their party affiliation was changed without their consent. Because the New York primaries are closed, independents and unaffiliated voters are not able to participate in Tuesday’s hotly-contested primary. While there was no hearing, the lawsuit wasn’t thrown out, either. Affected voters were told to ask for affidavit ballots (another name for provisional ballots), as they may be counted in the future, depending on the outcome of the court case. The lawsuit is likely not going to affect voters who were not able to change their party affiliation in time, like Eric and Ivanka Trump, two of GOP candidate Donald Trump’s children. Democratic presidential hopeful Bernie Sanders sought to comfort independents who weren’t able to vote for him. The Brooklyn native gets boosts from non-Democrats in open primaries. If correctly registered as Dem and weren't on rolls for #NYPrimary, ask to vote via Affidavit. Don't wait for Injunctive Relief from court. Cantalupo claims that last May the Department of Motor Vehicles lost his paperwork to change his party affiliation. When he tried again in December, it was already too late ‒ the deadline to switch parties before the closed primary had passed in October. For its part, the New York Board of Elections blamed the counties for any voting problems.